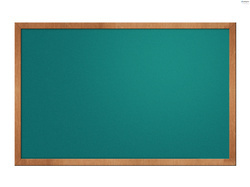 We offer a wide range of Green Chalkboards. This range of Green Chalk Board is offered in multiple specifications with respect. Banking on our enriched industry experience, we are engaged in offering a huge gamut ofProduction Display Board.We Bring forth an impregnable range o f production display board. These production display boards are highly appreciated for its high quality, durability and optimum performance. We take into account the diverse requirements of our clients and offer suitable range of production display board.